Simplicity, man. As I mentioned last week, I just wanted the easiest dinner possible. Something healthy, but something that didn’t require a million steps or ingredients. 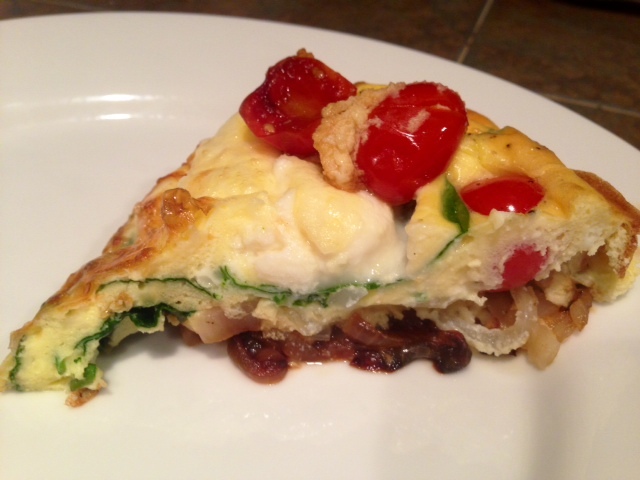 So I made some delicious marinated grilled (well, sauteed) chicken, and this delightful frittata. 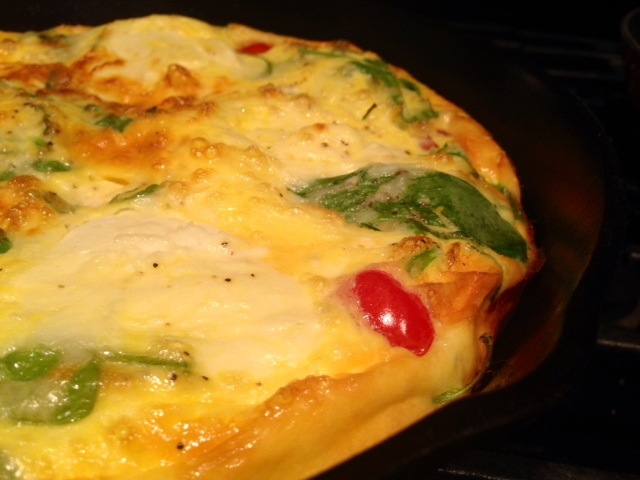 Frittatas are such a great go-to meal for breakfast, lunch, or dinner. They’re full of veggies and protein, easy, and make awesome leftovers. Basically, they’re perfect. 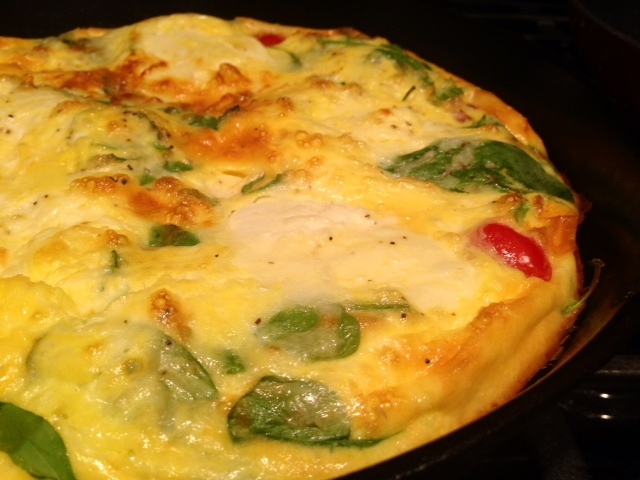 Heat oil on medium-low or medium in a large, oven-safe non-stick pan (I recommend cast iron). 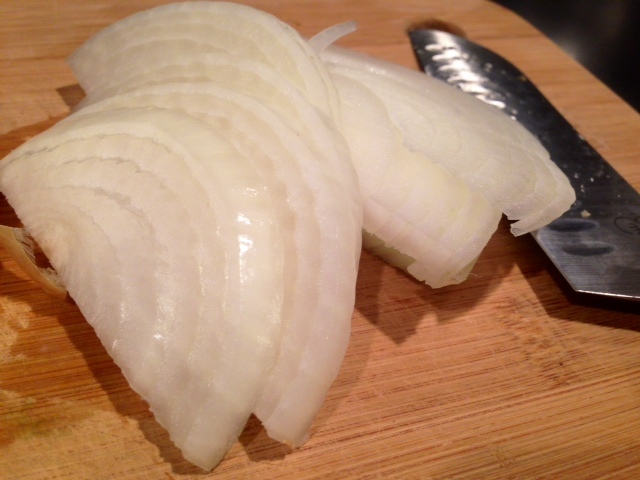 Slice the onion finely and add to the pan. Add a little salt and cook for 5-6 minutes, until softened and lightly golden. 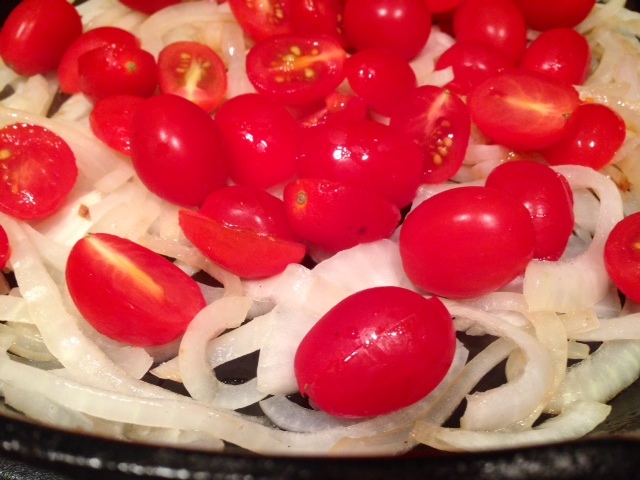 Slice the tomatoes in half and add to the pan, then let it cook a minute to soften. 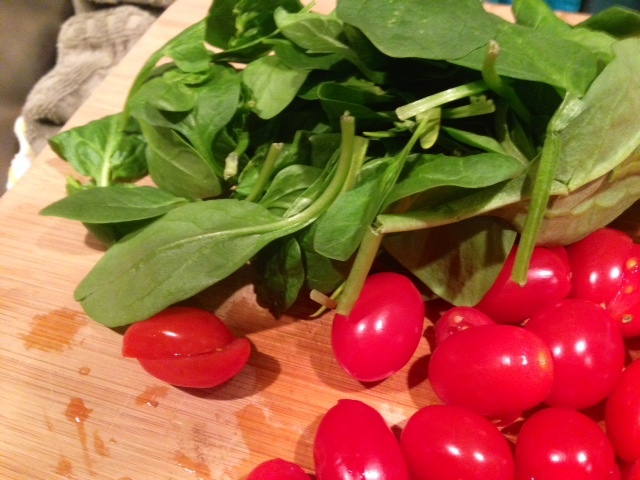 Remove from the heat, and add the spinach leaves and basil. They’ll wilt after a minute or so. Then take large scoops of the ricotta and dot over the vegetables. I dot it in a circle, so that all pieces have a little bit. Beat the eggs and stir in the salt, pepper, and parmesan cheese. Pour over the vegetables and ricotta. Let it cook for a few minutes until it begins to set up on the bottom and sides (3-8 depending on your stove and pan). Transfer to the oven and bake for 15-25 minutes, until the middle is almost entirely cooked through. I sometimes put a fork in the middle to help conduct heat there, and it will set up a little bit in the middle a little once you pull it out of the oven. Let sit and cool for about 10 minutes before cutting into and serving. 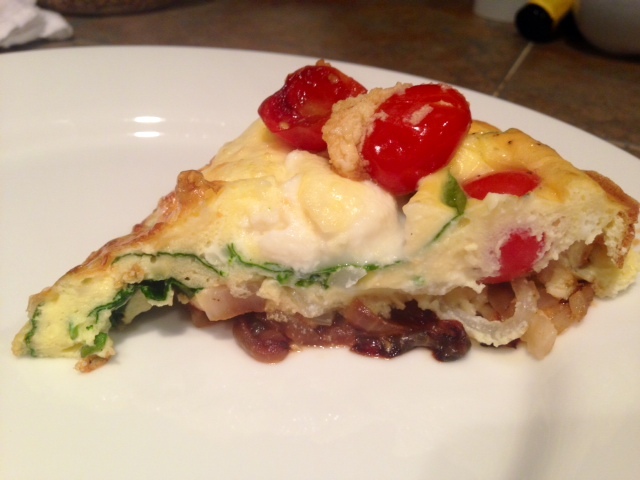 Will keep in the fridge for 4-5 days as well—makes great leftovers! 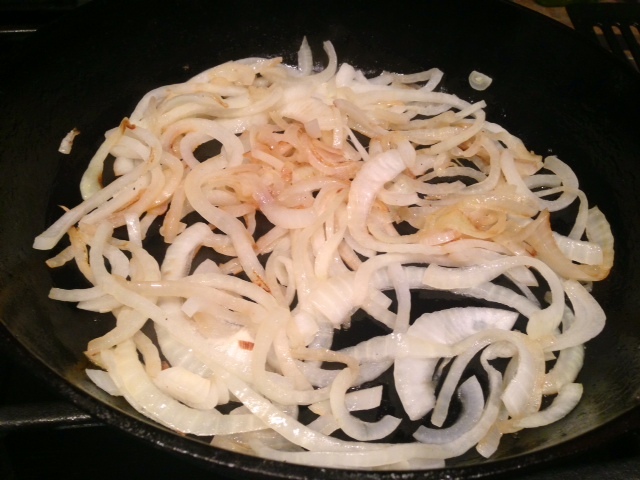 Heat the oven to 400 F. Heat oil on medium or medium-low in a large, oven-safe non-stick frying pan (I recommend cast iron) and cook the onion for 5-6 minutes until softened and lightly golden, adding a little salt. 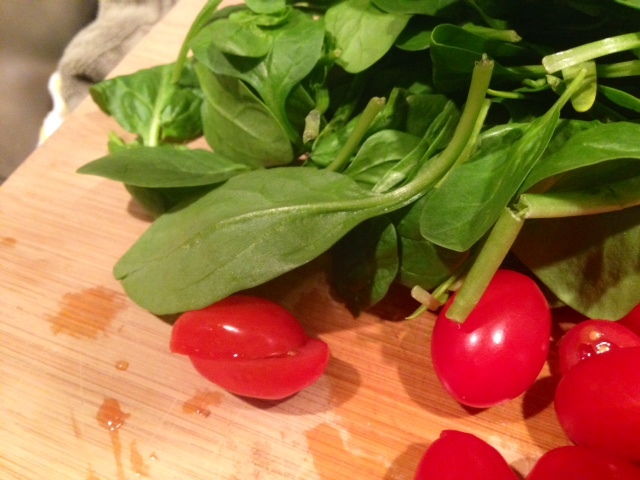 Add the tomatoes and toss for 1 minute to soften. 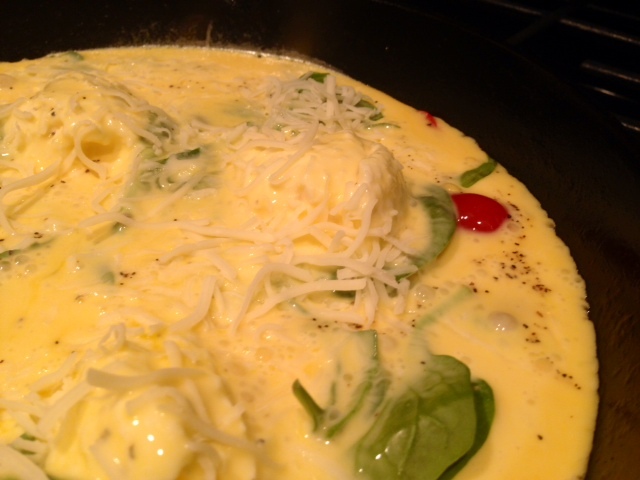 Beat the eggs and add the salt and pepper and parmesan cheese, stirring together. 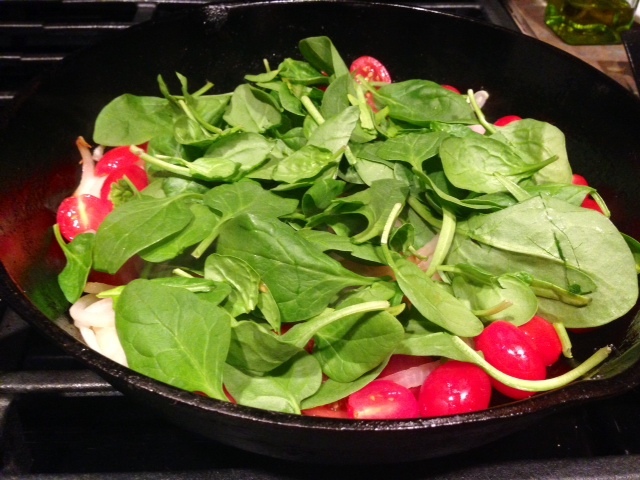 Remove from the heat, and add the spinach leaves and basil. 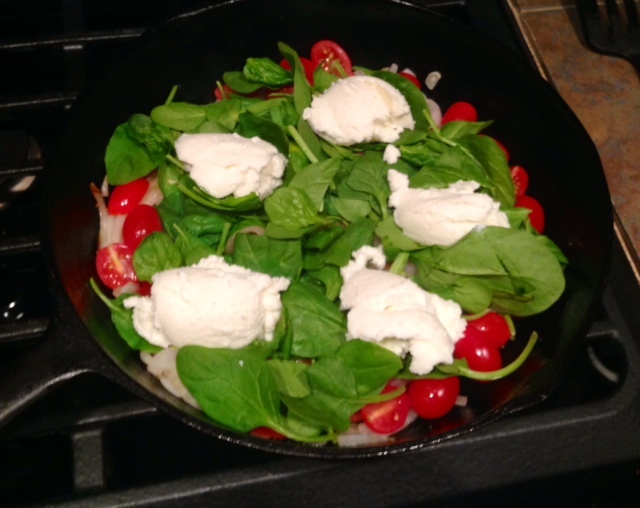 Take large scoops of the ricotta and dot over the vegetables (I dot it in a circle). Pour the egg mixture over the vegetables and cheese. Cook on the stove for about five minutes, until the sides and bottom set up. Then transfer to the oven and bake for 15-25 minutes, until the middle is almost entirely cooked through (it will set up slightly once you pull it out of the oven). Let sit and cool for about 10 minutes before cutting into and serving.